One of the most famous Taoist mountains in China, Mount Qingcheng is an alluring natural spot to spend your day. Surrounded by surreal mountain peaks, lush green trees, this mountain is dubbed as ‘the most peaceful ad secluded mountain under heaven’. The mountain can be roughly divided into two parts- the anterior part and the posterior part. The anterior part has attractions like Jianfu Palace, Shangqing palace and the Tianshi Cave. Cultural relics and natural beauty make it a pleasant site to visit. Several Buddhist temples adorn the mountain and the natural backdrop adds to the allure. Hop on a cable car to get here! Ideal for day-out and picnics! Pack your lunch as not many eateries are available. It can get chilly at the top of the peak, so carry warm clothes. The given ticket price is for Anterior Mountain. It is ideal for a day-trip. Reach their as early as possible to make the most of it. How popular is Mount Qingcheng? 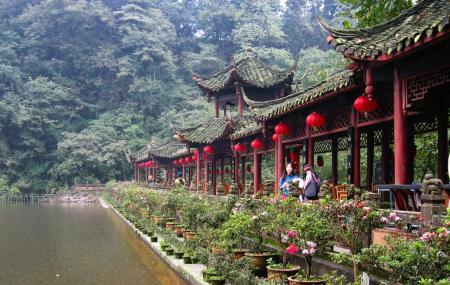 People normally club together Erwang Temple and Luodai Ancient Town while planning their visit to Mount Qingcheng. People also prefer to start their day with Mount Qingcheng.